Wine Tastings can be Informative and Fun! It is a shame that too often the term “wine tasting” congers up an image of elitists dressed in formal wear swirling expensive goblets and immersing their noses into the glass only to arise from the vessel with a look of judgment. The truth is, wine tasting is for everyone who loves wine. And, it can be a blast! Whether you want to learn more about wine or just figure out what kind of wine you want to buy, wine tastings serve to inform and entertain. If you are at a dinner party and you’re enjoying the wine, of course, you have in effect tasted it. It’s a good idea to make a mental note regarding the wine label and menu to influence your future wine purchase. Look at the wine. It is best to have a small amount of wine preferably in a clear glass with a stem. The limited amount of wine allows you to swirl the wine while looking for clarity and sediment. If the wine is relatively young, it should not have much sediment. As a rule of thumb red wines get lighter with age and white wines become darker with age. Smelling the wine may be the most critical step. By initially taking quick sniffs and then, yes, actually placing your nose well into the glass you will pick up the aromas of fruits, herbs, woods, nuts, and other scents to help determine what to expect when tasting the wine. Listen for bubbles. If the wine is champagne or another sparkling wine you should hear some fizz. If the wine is still and you pick up effervescent noises, well, then there is a problem! Feel refers to the term mouthfeel. When you first take a sip of the wine, hold it on your palette to see what kind of a sensation you get regarding texture. It may be velvety, smooth or acidic. How the wine is stored often determines the mouthfeel. Tasting the wine should be done with all the other senses in mind. Make sure to taste it slowly and have a couple of sips to get the full effect. Wine wheels provide a great guideline to help determine aromas and flavors. And, to make the event more festive, wine wheel t-shirts are available! Minimally though, make sure crackers, such as oyster crackers are provided to clear the palette between wine varieties. 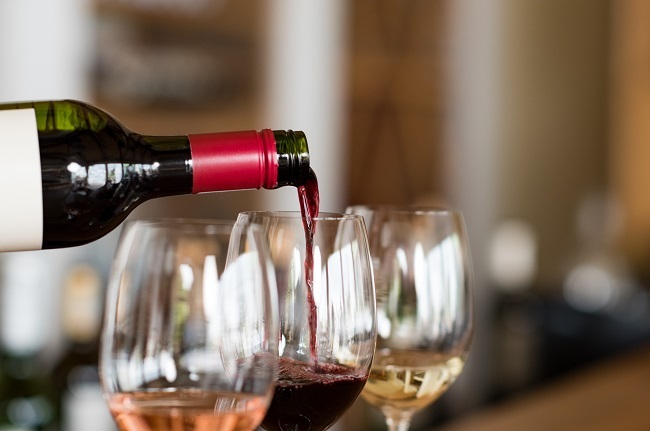 Whether it is part of a dream vacation or just a weekend event, wine tasting with family, friends, or your main squeeze provides an enjoyable and educational experience. There are wineries, of course, all over the world awaiting exploration. Or, create your own wine tasting. The Cookline has the perfect facilities to host such an event if you require more space than your home offers. If you love wine, don’t wait to plan a wine tasting adventure. For more information on wine tastings contact us.